Simple Shacks are hand-built onsite. We build anywhere and anytime of the year!! This cabin is our most basic model. 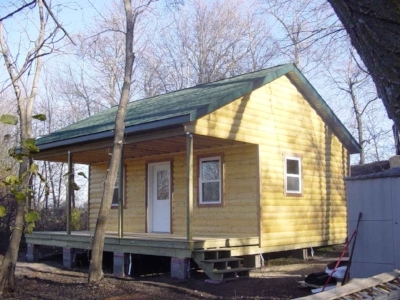 It makes a great starter cabin that can later be converted to a bunkhouse, workshop,etc. This steeper roof line lends itself to a broad range of design options in design including Dormers, Lofts, and second floor rooms. It is perfect for larger groups of people. 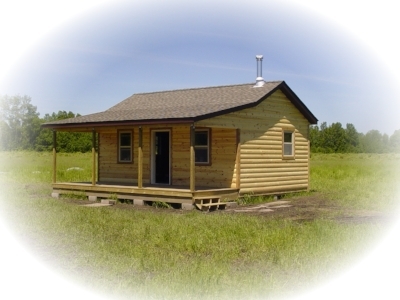 This cabin offers the option for a small sleeping loft on either end and a cold storage area over the porch. This one is perfect for a weekend shelter or deer camp. There is a small loft suitable to sleep in. The steep roof line gives a great sense of space inside, and the small covered porch is perfect for those rainy days. This is currently our most popular model. It features 10 foot sidewalls with a half loft you can walk in and is roomy enough fore two beds leaving the main level open to a variety of floor plans. My latest design, this cabin features a very low ceiling, Its 3 foot overhang provides shelter for ATV's, equipment, etc. The extended roof line in front allows for a very inviting porch area.